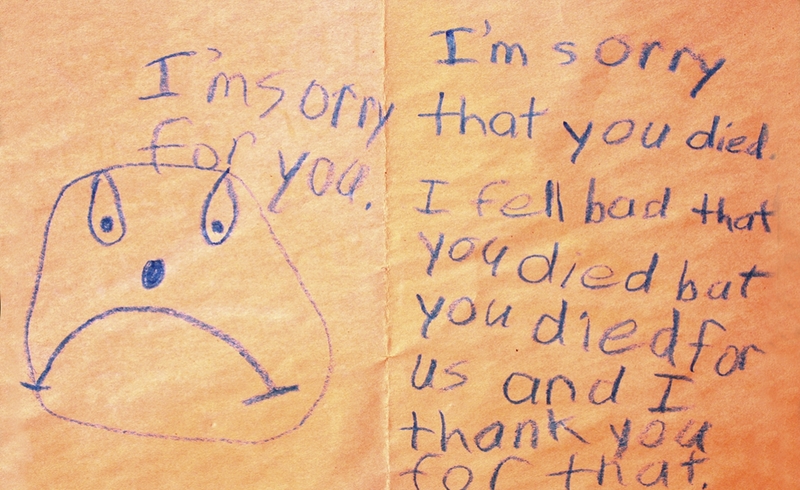 This note, left by a little girl at the Flight 93 National Memorial says, "I'm sorry for you. I'm sorry that you died. I fell [sic] bad that you died but you died for us and I thank you for that." Mary Margaret Kerr, a professor of psychology in education at Pitt, studies the tributes left behind at the Flight 93 National Memorial. 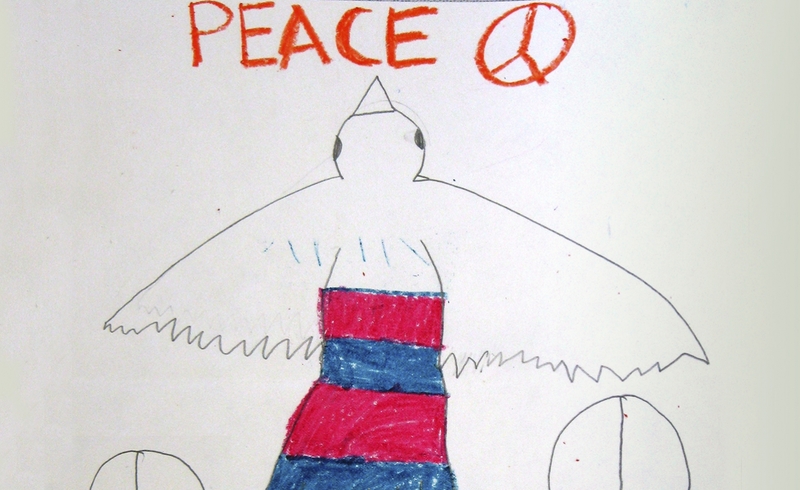 She said that many of the children's drawings call for peace, unity and love. "Few reveal anger or revenge." 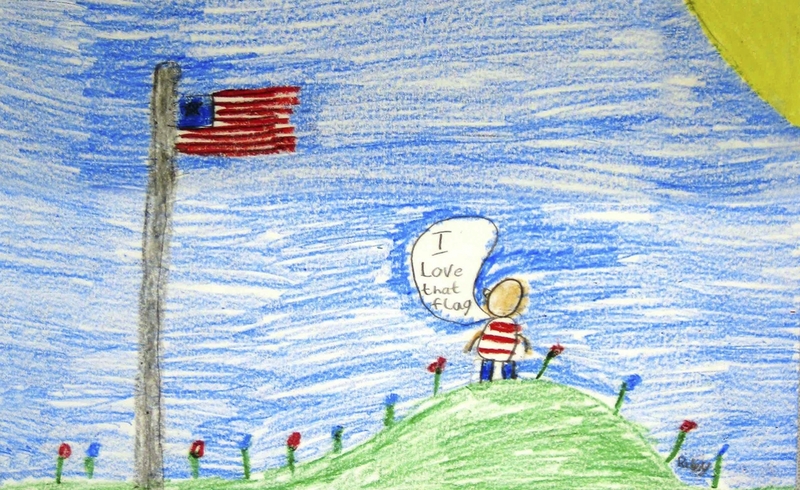 The Pitt team studying drawings left by children at the Flight 93 National Memorial have found that flags are a recurring theme. “Even very young children express complex feelings about this tragedy," Mary Margaret Kerr said. 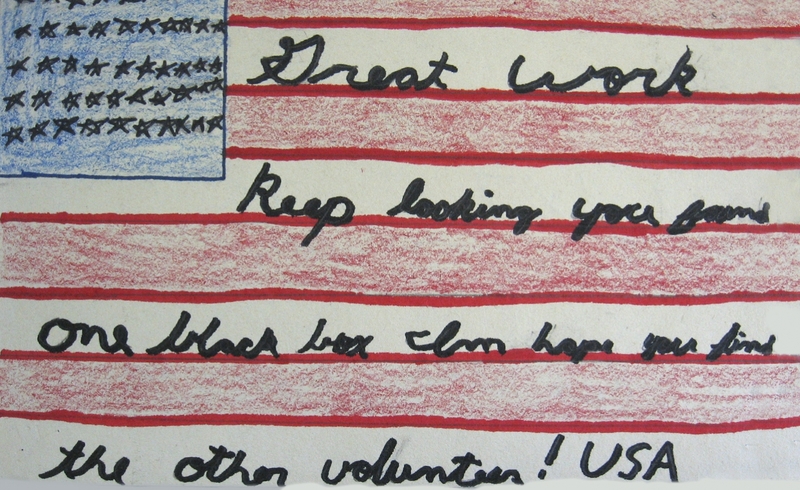 The child who drew this tribute wrote, "Great work keep looking you found one black box I'm hope [sic] you find the other volunteer! USA." 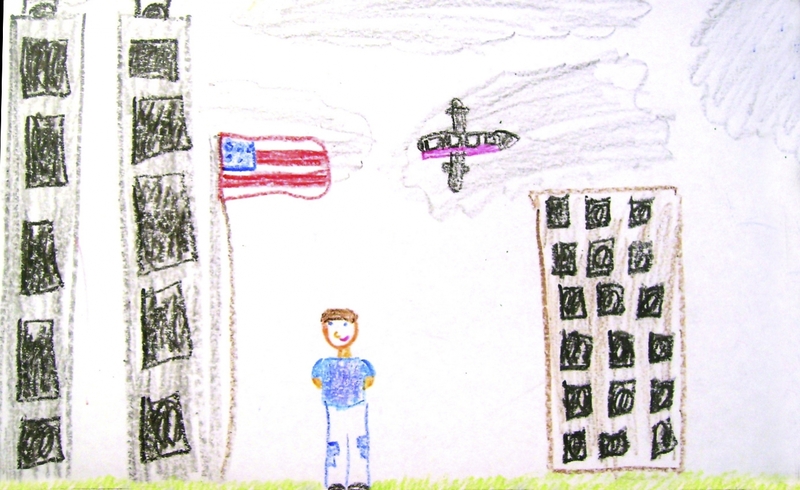 A boy, age 8, drew himself next to the standing World Trade Center towers. Forty civilians perished aboard United Airlines Flight 93 on September 11, 2001. The flight — which crashed in Shanksville, Pennsylvania — was one of the four hijacked planes used in the 9/11 terrorist attacks. 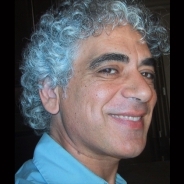 Moments before the crash, passengers and crew banded together to commandeer the plane from knife-wielding terrorists, thwarting an attack on Washington, D.C.
Kerr is a professor of psychology in education whose academic research focuses on assisting children facing crisis due to life circumstances, traumatic events and mental illness. In 2012, she combined her academic expertise with her esteem for Flight 93’s passengers and crew to create the University of Pittsburgh Flight 93 Research Team. Working in partnership with the Flight 93 National Memorial, the all-volunteer team launched a series of initiatives to help explain to elementary school-aged children the topics surrounding Flight 93 and 9/11 as a whole. The team’s contributions have included developing Junior Ranger Program booklets — pamphlets that help children understand the history and context of the Flight 93 crash site. The newest edition of the pamphlet was recently completed and will be in use at the national memorial this fall. The team also contributed to “Through Their Eyes” — a monthlong display within the Learning Center of the Flight 93 National Memorial that featured “mementos of tribute” — drawings, notes, photographs and other items left behind by children at the crash site. Most recently, Kerr’s research team collaborated with graduate students in visiting assistant professor Eleanor Mattern’s Access, Systems and Tools for Archival Collections course last spring. Through this partnership, students investigated how to improve public access to the Flight 93 Oral History Project, a collection of more than 850 interviews with key figures connected to the incident. The result was a series of recommendations now under consideration by the National Park Service on how using keywords, summaries and other metadata can make the oral histories easier to discover and navigate for historians and the general public. We consider it a privilege to keep their memories alive. Mattern, a 2014 alumna of Pitt’s PhD in Library and Information Science program, researches information policy, digital stewardship and record keeping. She said she considered it a personal privilege to supply her students’ expertise to this effort and said that the project also served as a meaningful experiential learning opportunity for her students. Kerr will commemorate the anniversary of 9/11 at a special ceremony within the Flight 93 National Memorial. She plans to continue her work there for the foreseeable future, aiding National Park Service professionals in further refining educational programs and outreach efforts. Next spring, she will take her team to the Pentagon’s memorial in Washington, D.C., to study how children have responded to that site.